Humana participated in the activities promoted in Torrelodones (Madrid) and Cabezón de la Sal (Cantabria) to commemorate this day. On June 5, World Environment Day, many events were held throughout Spain in commemoration. 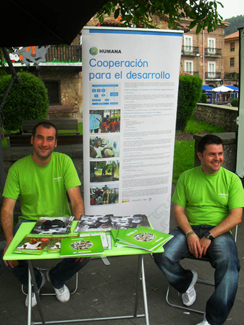 Humana was present at two such events: Torrelodones (Madrid) and Cabezón de la Sal (Cantabria). 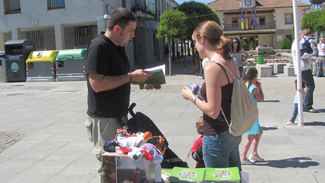 In Torrelodones, Humana participated as a juror in the "Recycle and Transform" competition. The Education for Sustainable Development team also took this opportunity to disseminate information about Humana among the attendees, using puppets made ? ?from secondhand clothes. The response from attendees was very positive, both in regards to the contest and the puppets. At Cabezón de la Sal, Humana organized a small awareness campaign and a clothing and shoes collection drive. This project's activities included (for example): a visit to the municpality's redwood forest, a national monument; the campaign "Change the Bag Once and for All"; and planting flowers with children with the help of students of the Employment Workshop for Gardeners at Tecnoverde.sal. During the day, the activity collected more than 1,100 kilos of clothes and footwear. Textile recycling contributes to environmental protection, as it reduces the volume of waste generated: a garment that otherwise would go to a landfill is given a second life. In addition to the reuse of clothing and shoes, there is a reduction in the consumption of natural resources (such as water or fossil fuels) and the use of fertilizers and pesticides used in the manufacturing of textiles. In addition, reusing or recycling textiles reduces CO2 emissions.